80’s? Music? Retro Style? Kids? Netflix’s Stranger Things got a great mix of these elements and proved to be really popular. Now a new third season is coming. 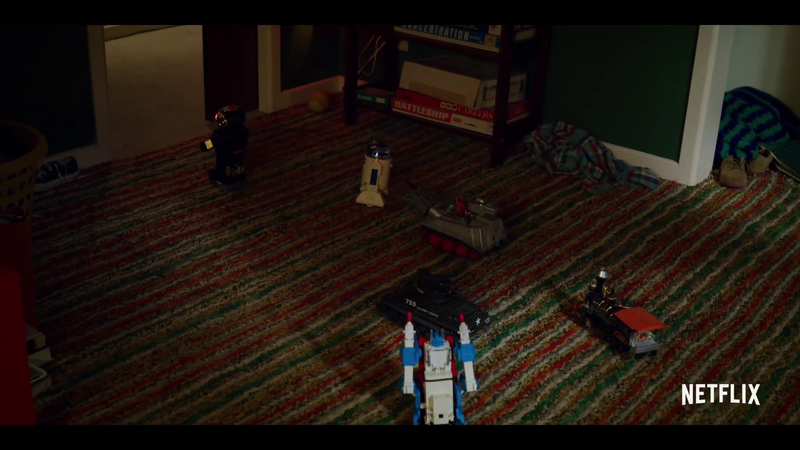 The trailer is out and, to the delight of our optics, G1 Ultra Magnus makes an appearance. 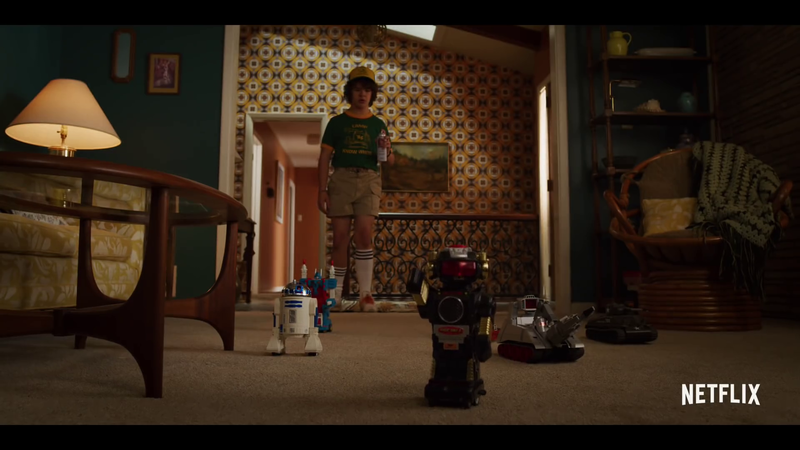 It’s a curious scene where Dustin (Gaten Matarazzo) is walking along with several of his motorized toys. 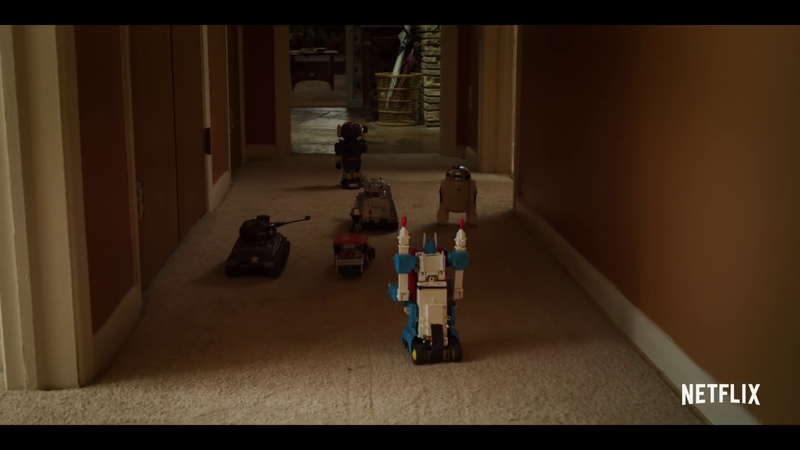 And… yes… we can see a magically motorized G1 Ultra Magnus moving around. It seems, a motorized part of another toy was added to the feet. A great retro call out for all G1 fans who we are sure will forgive seeing the missiles on top of Magnus’ shoulders misplaced. Check out the trailer below, and some screencaps after the jump! After that sound off on the 2005 Boards! A great retro call out for all G1 fans who we are sure will forgive seeing the missiles on top of Magnus’ shoulders misplaced. Last season a few members here noticed Ironhide's alt mode may have made an appearance. The character seen here with UM is Dustin and he's a pretty tech savy kid who built a working Ghostbuster trap so maybe he decided to add a motor to his own Ultra Magnus. I find it pretty cool they went to the effort of modifying a Transformer for this scene though as there's probably no shortage of RC robots from that time period they could have gotten hold of. Ultra Magnus just can't deal with the Upside Down right now! Of course he was always motorized. Remember he was Powered Convoy. The Powered Masters were named after him, because he was the first to have the gimmick they all shared. And he never will because he has cleidocranial dysplasia. Oh… Well rather than use my google machine I'll assume that is a disease/condition/disorder and say I did not know that. But thinking about it, didn't he have teeth in season 2? I thought I remembered thinking "Oh his teeth grew in over the last year" when I was watching season 2. Maybe he got fake teeth and i just wan't paying attention when it was explained. I wasn't really into S2 and felt it should have ended with the first season. Also Omega supreme. Or sky lynx, He’d fit into the era better. Freakin' time travelers abusing their powers. Stay in your timeline where you belong,dang it! Anyone else misread the title and expected a strange trailer for Magnus? Energon Ultra Magnus says hi. Kinda sad to see Ultra Magnus used that way as though he was some terrible 80s motorized toy robot with wheels on the bottom and stupid long arms with missiles on top of the shoulders. I mean, he was kind of a crappy toy, but this appearance of the toy does him no justice at all. Maybe the kid glued/taped him to an RC car lower half and put him together all wrong to create one of the first custom Transformers ever. I really gotta watch this show at some point. But it would be the sickest thing ever if that Ultra Magnus toy grew to life-size, started talking, transformed, gave the kids a ride and fought the Thing expy. Shoes on/off is a regional thing. Some countries do/don't, even within the US certain areas do/don't. I was talking about the people on television. I own a pair of slippers too. Doesn't mean I should take off my shoes. My house, my rules. Now if someone ask me, which they have before, I will take my shoes off. But I still have my sweaty socks on.